KATHMANDU, Feb 24: The National Reconstruction Authority (NRA) has asked the non-governmental organizations working in the earthquake-hit districts to extend technical support to the victims. During a meeting with the representatives of the major donors including the World Bank, Asian Development Bank, United Nations Development Program (UNDP) and other national and international non-governmental organizations, NRA Chief Executive Officer Govinda Raj Pokharel asked the NGOs and INGOs to extend support in areas such as livelihood, capacity enhancement and technical know-how to the victims to build earthquake resilient buildings. Pokharel asked the NGOs to make sure that the houses built by them are earthquake resilient so that people do not have to suffer again should another major earthquake hit Nepal. "We want you to ensure that the houses built are earthquake-resilient. It is so much the better if you could work in a single village instead of spreading your works in different localities," Pokharel had asked. The request by the NRA chief comes amid reports that the support of NGOs were scattered with a number of instances of duplications in their works. "We have told our NGO partners that NRA stands ready to help if they face any difficulties while carrying out their works," Pokharel told Republica. Besides asking for their assistance to build quake-resilient buildings, NRA CEO Pokharel also asked the NGO partners to extend technical support to make the quake victims self-reliant. 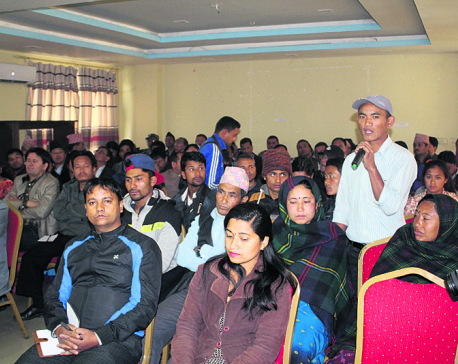 "We have requested them to extend support in areas such as livelihood and capacity enhancement," Pokharel said. On the occasion, NGOs representatives had said they will work in accordance with the request of the NRA. They had maintained that it would have been much better had they received a similar request right since they started working for the quake hit areas. Meanwhile, the NRA is planning to deploy over 4,000 final year engineering students in the earthquake-hit districts. The engineering students will provide technical assistance to the victims to build earthquake resilient houses. According to NRA Spokesperson Yam Lal Bhoosal, the NRA has already signed a memorandum of understanding with the Purbanchal University for 1,056 engineering students. They will be deployed in the districts starting next week. The Ministry of Finance has already released Rs 20 million for deploying the engineering students. The NRA has already deployed 2600 engineers to the districts. The engineering students to be hired for one month will assist these engineers already in the quake-hit districts. The students will be provided between Rs 15,000 and 18,000 as living allowance.